We do everything these days with text messages. Since the first one was sent to wish someone "Merry Christmas" across the other side of London on December 3rd 1992, we send now over 6 trillion messages every year around the world. Over 190, 000 of the messages (most of which are completely irrelevant, but which doesn’t stop the National Security Agency intercepting them) wing their way through the waves of cyberspace to ping into your phone, tablet and phablet…and so the list goes on. Texting became sexting as the phones became equipped with cameras and the lighting could be changed to make anyone look good on Instagram. To hell with the dangers of where your photo might end up, it’s all about living the care-free life and doing what you want…until your cyber identity is completely ruined. After the sexting came the relationship and the Breakup Text application that allowed you to send a text to break it gently that you had met someone else. Then came marriage and the kids, and divorce was even announced via a text and legally accepted in Malaysia in 2003. ‘At- Talâq’ took on a whole new meaning when printed on the screen of the smartphone. Now? Now, you can resign from your job via the new application that makes the telling easier when you can’t face the boss. All rolled into one application, you can fill in the details, resign and send the text message to the person concerned, and look for a new job all at the blink of an eye, or the whizz of a chip. 56% of US citizens now own a smartphone. 35% of US citizens that are 16 or older have a tablet today. 29% of Americans couldn’t live without their phone and 44% sleep with it. The phone, the smartphone, our access to the world has become an extension of our bodies and our lives. It is the appendage of Man of the 21st Century. 50% of the people that have smartphones download apps. 60% access the internet today. Today one third of all job searches are undertaken by users on their phones or on a mobile device. The first few weeks and months of a new year are the times when people are the most determined to make a break and change their lives. January is the biggest time when resignations happen. 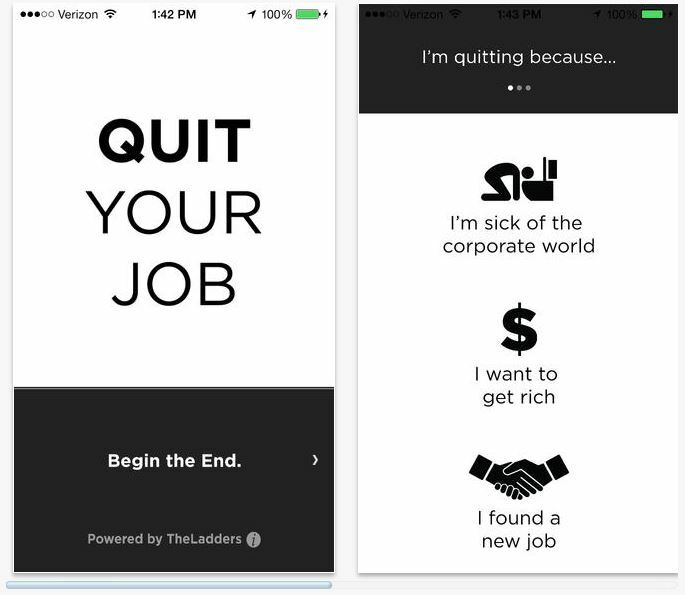 Dissatisfaction, career growth, new prospects are the biggest reasons cited for leaving employment today but the anxiety that goes with it vcan be taken away by the ne app developed by TheLadders (New York) that developed the app called Quit Your Job. Alex Douzet, the CEO stated: “It always correlates with New Year's resolutions. People think ‘I'm not happy and want to make a move”. Only one question remains: how professional will it be to quit your job in such a manner. Manning up and facing the music in front of the boss can be the best thing for one’s ego. Quitting your job, saying that your moving on to greater and better things is a great boost for your ego. But, who would have thought that we would be texting to make love, have a relationship, get divorced and moving on to other things today? We are and it’s become normality. The resignation app is perhaps the thing of the future! 74% of all mobile users in the world send text messages today and it is the most widely used form of communication available to us as a data service. The USA is lagging behind with only 60% of active users of text messages today still. In Europe some 80% of users take advantage of this means of communication today.